Jeremiah, one of our cover artists, comments on one of his pieces. The idea behind this piece will be immediately clear to anyone who has seen, or read, The Return of the King. The story includes a scene where a series of beacons warn of an impending invasion. 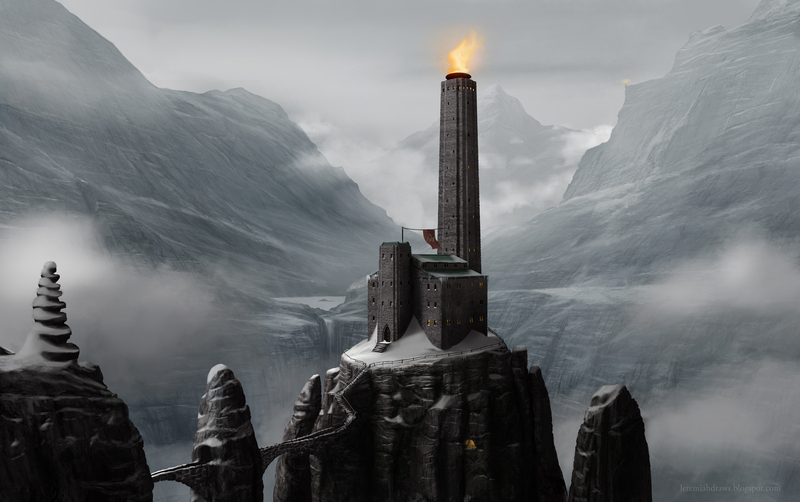 This piece wasn’t meant to be a part of Tolkien’s world though, and the purpose of the towers is open to interpretation. Perhaps they form some sort of magical protection to the land they encircle. Production wise, I started by modeling the tower in a simple 3D mesh to get the basic perspective. There are no photo-textures here, everything was painted using Photoshop’s powerful brush tools. The biggest challenge with this scene was portraying the vastness of the mountainside. Hopefully, I have succeeded. There is a grit in digital painting that I prefer to photo texture. Photorealism would not have that name if it was truly realistic. True. Plus photo-texture art all looks the same because there’s less brushwork, and therefore less of the artist’s touch. It’s great for the industrial side of concept art though, because you can render things much more quickly.